This time in the “People in Testing” series, I had the chance to interview Viktor Johansson. Viktor is currently working in New York City for a tech startup called Axial. Viktor is very passionate about mobile testing and likes to build devices labs with lego. If you have any kind of question to Viktor, you can contact via twitter. Daniel: What is currently your biggest challenge at work? Viktor: To keep up with our several, weekly releases. As an embedded tester in an agile team, there is a lot to test. New features are constantly being built. I need, together with the team, prioritize my testing and try to identify risk areas quickly. I am a strong believer in dogfooding. Everybody in an organization can test and bring value to a product. I have received good support from different stakeholders across the organization. Building those relationships, bridging channels of communication has been invaluable. It has not only helped increase the quality of our product, but has also given me a greater understanding of the business in order to be a better tester. Communication with the end users has also been essential. Which test automation tool are you using in your daily work and are you happy with it? Right now, I am using several things. For E2E automation I have been using Protractor, a framework developed to support AngularJS applications. And for mobile E2E, I have been using Appium and Protractor, since the app I have been testing has been developed using the Ionic front-end SDK. To automate endpoint checking, we have developed our own framework in JS to not only be able to assert things, but also, create data fixtures for our checks. I am pretty happy with the web tests, but am currently working on speeding these up, using Selenium Grid for parallel script execution on several different browsers. For mobile, I have been using Appium, which is cool but still flaky. There are not many people out there that are actually using it for mobile web tests either, which makes it hard to find useful information. I hope that the community will grow bigger and that these guys get more support though. Just the fact that Appium is Open source makes me take off my hat and bow to these guys. What do you think is the most important skill software testers should have? As so many others have said, and I am saying it again, good communication skills are an essential skill a tester should have. To be able to communicate with the developers, pair up with them and gather the information you need to test is so important. A high level of social and emotional intelligence, helps you connect more easily with the people that possess knowledge that you need. To be able to reach out to different stakeholders, interview them, ask them about their daily workflows, and involve them with the testing, etc. is also very important. Another important thing is to communicate and report your testing progress to project owners and managers. However, never bite off more than you can chew. You are currently working in New York City. How is the tester community there? I am, great city by the way, it never sleeps! The testing community in the Big Apple is prosperous. Last year, Kate Falanga, Anna Royzman, Tony Gutierrez and Perze Ababa started a meetup community called NYC Testers. This community has been growing rapidly over the last year and they have been hosting one meetup per month, which is great. I have been helping out with these meetups since day one. It has been great, and a hell of a ride being a part of that! Worth mentioning, is that we had CAST here in the city last year, and this year in November, we will have the first ever TestBashNY, which I’m stoked about! So the community is strong and growing! Which kind of mobile app do you recommend and why? I have to be boring and say Evernote. It is such a great app, despite its bugs and glitches, I am so happy to be able to sync all my notes’ across devices. I write a lot of notes, mind maps, take screenshots, GIF snippets, etc. and Evernote is a lifesaver. It has a pretty good screenshot extension too called Skitch, which I would also recommend. Viktor Johansson is a 26-year-old tester from Stockholm, Sweden. 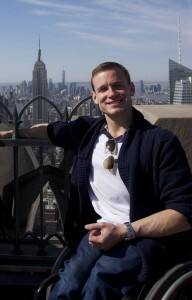 He is currently living in New York working for the tech startup Axial (www.axial.net). He is passionate about mobile testing and likes to build device labs with lego. Viktor is co. founder of crip.io, a company that strives to make the web a little more accessible for people with disabilities. Through crip.io, he also runs a podcast with his companion, and co-founder Johnie Hjelm. He’s a respected member of the context-driven testing community. Viktor has had a spinal cord injury since birth, which has given him the privilege to use a light and fast wheelchair. He plays wheelchair basketball for New York Rollin’ Knicks and used to play Wheelchair Floorball for Nacka HI (a club from Stockholm), as well as the Swedish National team back in Sweden. He also likes live music, especially rock. He attends many concerts and festivals every year. You can follow Viktor on twitter. How To Run Mobile A/B Testing Experiments? What Does Scrum Mean for Companies? And Why Should You Start Learning It Today?